“Nicholas Ray’s melodrama In a Lonely Place is one of the darkest, harshest, and most devastating love stories ever made. 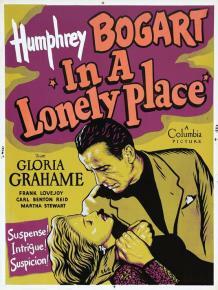 It’s an inside-Hollywood story, starring Humphrey Bogart as Dixon Steele, a gifted screenwriter with a mean streak. “Dixon meets his dream woman, Laurel Gray (Gloria Grahame), a fledgling actress, the very night that another woman he was with is found murdered, and he comes under suspicion. The clash of movie-world scandal with local politics gives the passionate affair a broad backdrop, as does Ray’s fervent depiction of fragile, high-strung artists caught between love and work.